I read somewhere that fading in is a great way for writers to introduce their subject. 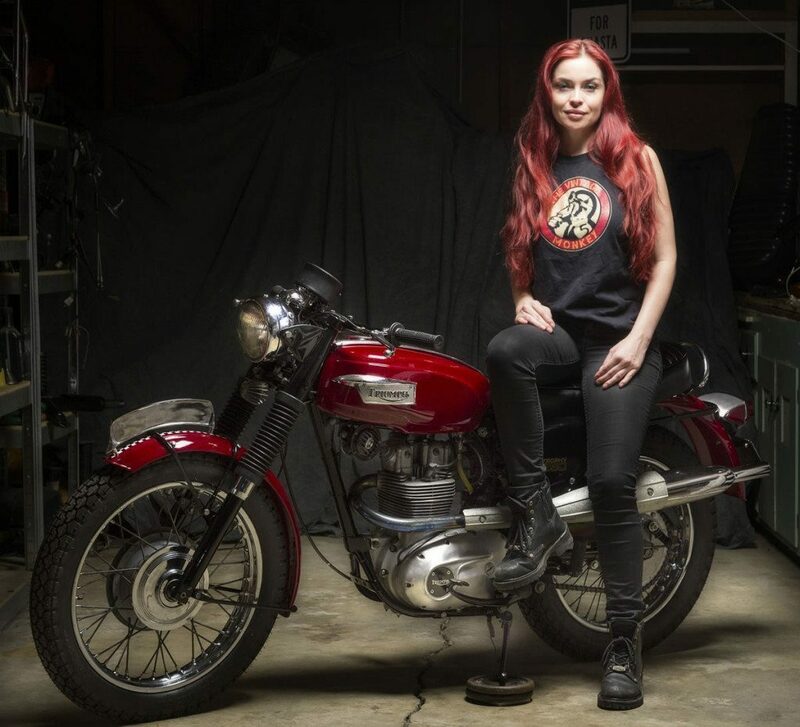 Unfortunately I’m not a writer, so I’m going to tell you in full detail exactly how Shasta Smith of The Vintage Monkey came to be the YouMotorcycle Woman of the Month for September 2013. When I first came across Shasta Smith, it was on YouMotorcycle’s Facebook page. She left a message saying hello. I took a look at her page and came across a series of pictures of a woman surrounded by motorcycles of yesteryears, thoroughly well restored through and through, with taste, tact and terrible coolness. Nothing was chosen at random, whoever was behind all of this put some serious thought and dedication into it. I was impressed. As I explored The Vintage Monkey, just who I had come across quickly became very clear to me. Here was a woman who could ride, wrench, run a business in the motorcycle industry and also happened to be beautiful. It was only a matter of time before I’d ask Shasta to be featured on YouMotorcycle. She was gracious enough to accept. Teriyaki beef jerky, my kid, and tissues. If you know me or have gotten to know me, you will get it. Building a business that has provided jobs for deserving people. YM: Hey Shasta, could you explain to the readers who you are and what exactly you do? Shasta: I’m Shasta Smith and I own The Vintage Monkey. I have a 15 year background in architectural design and on really good days I get to incorporate motor-sports into the interior of buildings. The Vintage Monkey acquires vintage motorcycles and artifacts, then respectfully modifies them based on designs by Shasta Smith. 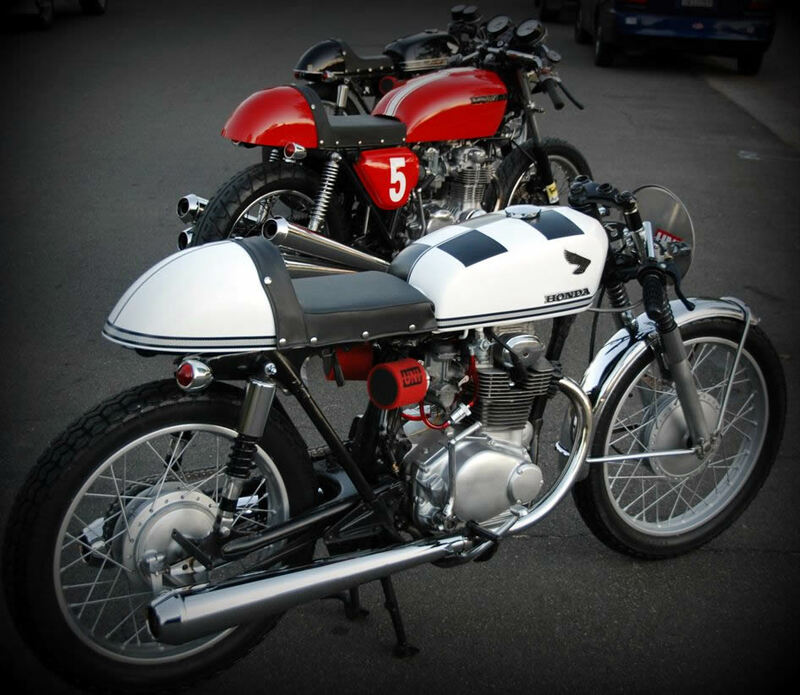 In support of the grease, The Vintage Monkey creates apparel, architectural elements, and is a motorcycle race sponsor. 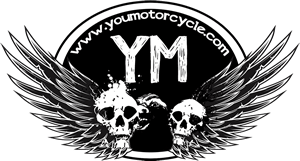 YM: What got you into motorcycles? Shasta: When I was a young kid, I always had a fascination with motorcycles, long before I had ever touched one. I remember the first time I saw one long ago (and took notice). It was an early 70’s BMW and it had been restored with gloss black paint, white checkers and a café seat. To this day I still think about how much I wanted that bike. When I was 19 years old I had saved up enough money to buy my first new bike. Now days I have a garage full of vintage bikes that I have restored and in various stages of restoration. When I ride I usually ride alone (to clear my head and have time to myself). I have a 1972 CB175, 1970 CB350, and a 1970 Triumph Trophy. YM: Any favorite motorcycle events? Shasta: I attend about 5 events a year. Some I participate in and others I’m a spectator. I’m looking forward to the best of the best at the Barber Festival. YM: What’s the reaction like to the whole motorcycle mechanic chick thing? Shasta: They either think it’s cool and great conversations are sparked from it, or they think it’s not real… and that is when I say “You are welcome to visit my garage”. YM: How does it all make you feel? Shasta: I enjoy what I do and 99% of people are friendly and love to hear about and watch what is going on in the shop. YM: What do you love most about your life? Shasta: As far as my work life; I love the transformation of projects and being able to have creative freedom in what I do. YM: What else sets you aside from the rest of the boys in Sacramento? Shasta: Now that I think about it, I’m probably the only female shop owner. Not too shabby! Shasta: The biggest challenges have not been the bikes themselves, but more or less who you can trust and rely on in the business. If you work on bikes, you know what I mean. YM: I worked in the industry for just over two years, I know exactly what you mean. Let’s get back to the road though. What was your most memorable motorcycle ride, event, or adventure? 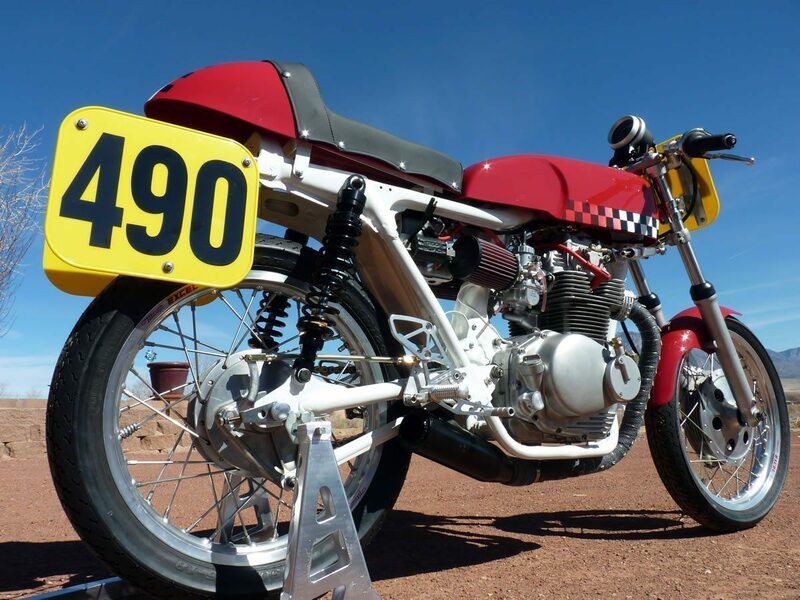 Shasta: When I was 19 years old I packed my bags, strapped them to the back of my bike and rode about 200 miles to camp at the race track for the superbike races. I woke up in the morning to the sounds warm up laps. YM: Since we’re getting personal, got any secrets? I promise I won’t tell! Shasta: Anyone who meets me in person knows I’m an open book and a goofball. I like to consider myself a pretty private person, but it turns out I don’t hide much. 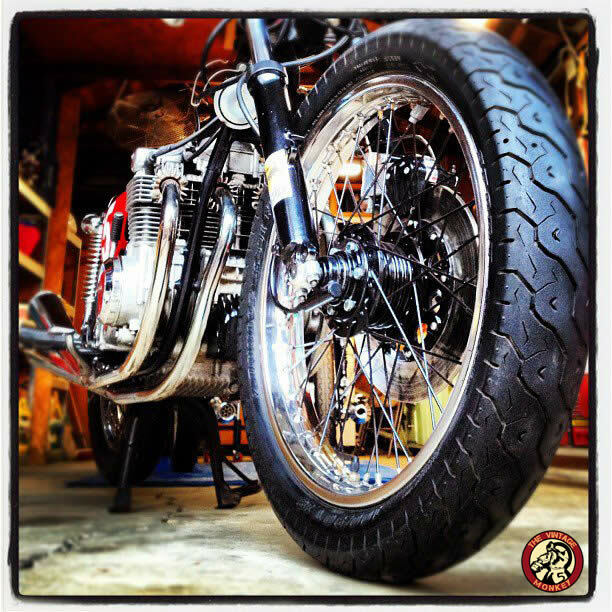 YM: How does being a motorcycle mechanic make your life different than the regular goofball Jane’s? Shasta: It makes my life different because unless you are into motorcycles, no one understands why I do what I do. They think its cool, but they don’t always know how to spark up a conversation about it. 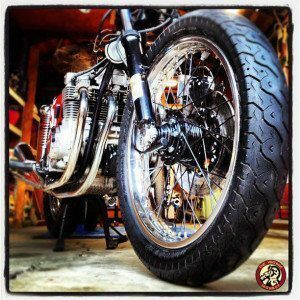 YM: Speaking of sparking up a conversation, say you’re sitting on a bar patio enjoying a drink when an average looking guy parks his motorcycle out front and comes in to the bar. He’d like to approach you but doesn’t know how. What should he do? Shasta: Crack some jokes! If you get me laughing, I’ll talk to you all day long. YM: What should he absolutely NOT say to you? YM: Ouch! On that note, what’s your biggest pet peeve while riding? Shasta: People in cars see long red hair coming out of my helmet and often start swerving in my direction to get a closer look… too many close calls. A big thank you to Shasta for sharing a little bit about herself and The Vintage Monkey with us today. You can read more by visiting: TheVintageMonkey.com and see their daily shop posts on Facebook. Shasta joins the likes of extreme distance rider Madeline MISSRIDER Velazquez, performing artist Danielle Gnidec, alternative model Freyja Van Siren, powersports director Sabina Heilman, and our future Women of the Month. Stay tuned for more! Shasta seems like a woman who is really living the dream. She gets to work on something she is extremely passionate about. It is surprising, however, that there would be so many clueless men in the world who would actually ask if she works on bikes. Just because Mad Men plays on TV does not mean we have to bring back the 50s.